Chanteur Country US né Lionel Burke Cartwright, le 10 Février 1960 à Gallipolis (Ohio). 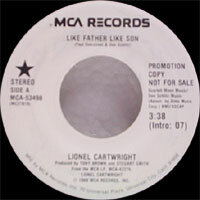 Lionel Cartwright was a multi-talented performer and songwriter whose career took off in the late '80s. Like his peers Garth Brooks, Travis Tritt, and Alan Jackson, Cartwright favored a contemporary country-pop sound. His love of music began during childhood piano lessons; Cartwright also went on to master the guitar and eight other instruments. At age ten, he began performing at community gatherings in his hometown of Glendale, WV. While in high school, he was a regular on a country radio show in Milton, WV, also appearing on Columbus, OH's Country Cavalcade. After joining the Wheeling Jamboree in West Virginia as a pianist, he was soon promoted to performer status, and from there became the show's musical director. Cartwright started working on the Nashville Network music and comedy series I-40 Paradise in 1981 and later on the show's spinoff, Pickin' at the Paradise. On both shows he served as a performer, arranger, and musical director, also writing and performing the theme songs. While working on the show, he met Cindy Stewart, who went on to become his songwriting collaborator and wife. He also met Boudleaux and Felice Bryant, the two composers behind many of the Everly Brothers' greatest hits, who encouraged him to further develop his songwriting skills. While performing live in Knoxville, Cartwright was spotted by MCA producer Tony Brown, who was impressed but felt the young singer needed more experience before he could land a record contract. 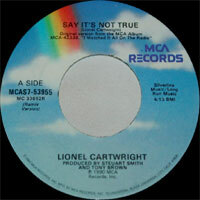 In 1986, Cartwright went to Nashville with his best songs and had a formal audition with Brown, who signed him to MCA. In 1988, Cartwright released his debut single, "You're Gonna Make Her Mine," and scored a Top 50 hit. He also released a self-titled album in 1989, which contained the aforementioned single and three other Top 20 hits, including "Give Me His Last Chance," which made it to the Top Five. His next album, I Watched It on the Radio (1990), contained several hits. 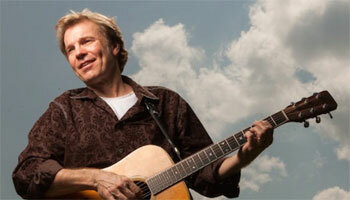 He scored his first chart-topper, "Leap of Faith," in 1991, from the album Chasin' the Sun.